Christmas, like the Lunar Chinese New Year for the Chinese, seems to be a popular time when people like to get together in a spirit of festivity. It’s a chance for families to gather from far and wide to catch up on the latest. But whether people come together to celebrate the birth of our Lord, or simply get together to see each other and exchange gifts, Christmas can be a mixed time for many. When people get together, in can be as much an occasion of difficulty as joy. Old rivalries and tensions may resurface, and arguments flare up as the Christmas wine loosens the shackles of politeness and self-control. Painful memories long buried tend to emerge when you come face to face with family members which you have deliberately sought to avoid. And for others, there is the pain of loneliness arising from family breakup, the isolation brought about by mental or physical sickness. No wonder suicide rates go up. Smiling faces of people around the family dinner table and peals of laughter can seem a world away from reality. It doesn’t help when the Feast of the Holy Family follows immediately after Christmas and the Holy Family of Jesus, Mary and Joseph is set up as the benchmark for family life. How could we ever match up to this impossibly perfect standard? In fact, the family group of Jesus, Mary and Joseph can appear too good to be true, not relevant to us in the kind of world we have to live in. They seem to belong to a naive world of unreal, cut-out religious figures, so unlike the conflict and tension, deep-seated resentment and un-forgiveness that so many of us experience in our own families. So many of us would walk away with a sense of guilt that our own family lives are too messy. The painful truth is that not one of us comes from or is perfectly replicating a family that includes the Word made flesh, the Virgin conceived without sin, and the most just Joseph. Our family histories are marked by a Trinity of destruction: sin, violence and disorder. But is the Holy Family unreal? I think the Christmas story provides us with a picture that is far from our idealised perception of the Holy Family. The Holy Family, as scripture tells us, is a truly human family, a truly real family, and their story would have made a perfect script for any modern popular reality television show. Perhaps one of the most striking messages of the story of Christmas then, is that family life doesn’t always run smoothly even for this most special of families. Right from the very beginning, there is struggle, hardship, and the need for extraordinary courage and endurance in the face of these difficulties. It is important for us to remember that the Holy Family’s life was thrown into a crisis even before the birth of Our Lord. Mary was deeply disturbed by the words of the angel Gabriel that she would bear a son though still remaining a virgin. Joseph grappled with the discovery that Mary was with child, and not his child. Shame, betrayal, and the prospect of divorce was very real. The circumstances of the birth of Jesus were not the easiest nor the healthiest. Simeon, in the Temple at Jerusalem, had baffling things to say about the child's future, and predicted that a sword would pierce Mary's soul. And he turned out to be right, when Mary stood beneath the cross of her Son. Soon after that, the peace and stillness of the manger scene is brought to an abrupt end with the news that Herod is in search of Jesus, and plans to kill Him. Joseph takes Mary and Jesus by night on a journey to safety in Egypt. They become refugees, dwelling in a strange land. Many years later, his relatives had to set out to take charge of Jesus, it being said that he was out of his mind. The Holy Family is as real as a family can get. Therefore, the Feast of the Holy Family is not intended to make us deny the humanity of our family but to acknowledge it and even celebrate it. This is what we celebrate at Christmas: in Jesus, God unites Himself to an entire human nature. He fully enters into human experience, with all its peaks and valleys. And a part of that human experience, with more than its share of peaks and valleys, is family. Family life is exceedingly difficult and not even the Holy Family was spared its challenges. For this reason, the feast of the Holy Family is not intended to make us feel bad that our families fall short of the measure of Jesus, Mary, and Joseph. Rather, it presents to us the fact that even the messiness of family life is part of our salvation. And our family life like that of the Holy Family is not absolute peace and perfection. The Holy Family exists in a world in which the innocents are slaughtered, in which they become migrants in Egypt, in which they lose their Son in the Temple, in which they gather around Joseph at his death, in which Mary watches her Son die upon a Cross at the hands of the Roman Empire. Even in this mess, salvation does unfold. So, the Holy Family isn’t a postcard picture perfect family of grinning members. No, that’s not how scripture describes them. The Holy Family keeps its sustaining power and attractiveness, not least because its members and their goodness are for real. 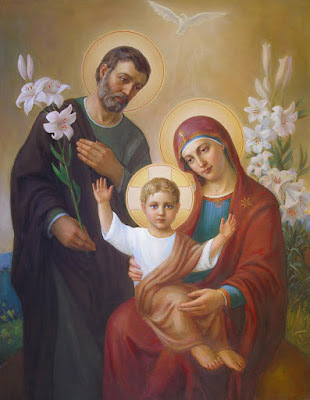 For the members of the Holy Family, there were human lives to be lived, always real and at times demanding even for Joseph, a saint, for Mary without sin, and for the incarnate Son of God. The goodness of the Holy Family was tried and tested, and is therefore true and reliable. Yes, the Feast of the Holy Family completes the Feast of Christmas. The Church understands this because she understands that we all need to hear that the Word became flesh, forever transforming what it means to be in relationship with one another. We all need to hear that God loved us so much that God entered into the messiness of history, not as an idea but embodied in a family. We all need to hear that our salvation is inseparable from those very real obligations that we enter into as members of the human family as a whole—obligations that become gifts. We become holy not by becoming less real but that holiness is what makes us truly real. So even in the midst of families that have been torn apart by divorce, by abuse, by sin, even in this messiness, the Word has become flesh and lived among us. This truly is the feast worth celebrating. This is the Feast of the Holy Family.